Three specs clustered ahead on the horizon, two Champs and one Colt. From the radio chatter, I knew that Lee's Colt was in trail behind the Champs at 3,100 feet. 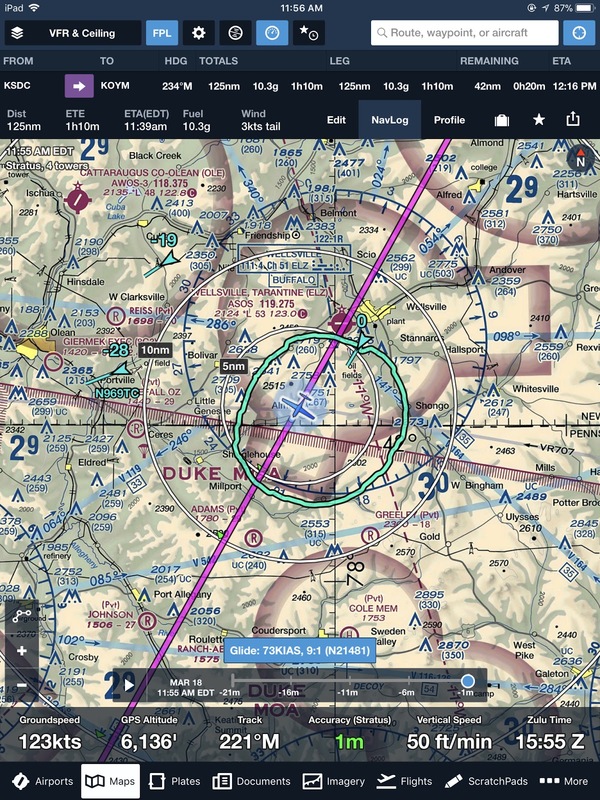 A cyan triangle on my ForeFlight display indicated that the transponder-equipped Colt was three miles ahead of my airplane. As primary targets only, the Champs were ignored by the ADS-B system, stealth ships as far as the FAA's traffic information service was concerned. 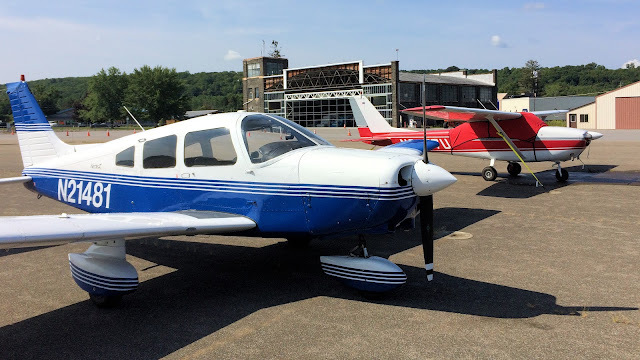 I flew alone alone in the Warrior, the last of four aircraft to launch from Sodus at 7:30 am that morning for breakfast in Dansville. I wrestled with conflicting desires for power settings. Pulling the power back (way back) would keep me from blowing past my friends in the other three airplanes. But I also wanted to get the engine oil hot and operating at low power would not be adequate. They teased me on the radio that morning when I taxied into line behind them at the departure end of Sodus' runway 28. "Look, there's a real airplane joining us this morning!" "Mornin' Chris," Lee added kindly from the Colt. I pulled the power back 100 rpm to reduce speed and studied the iPad. 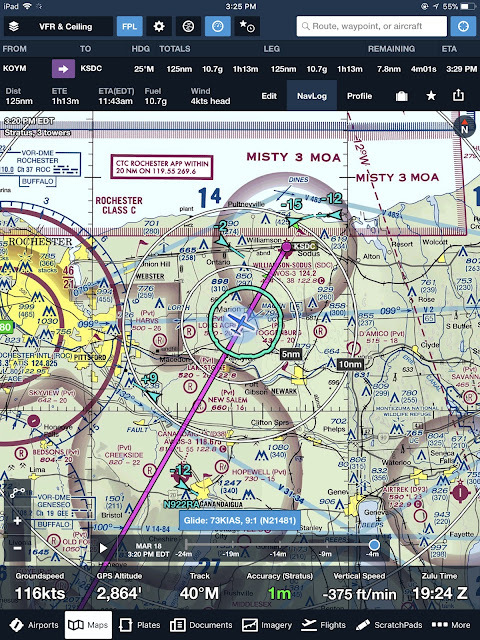 Lee was flying a line directly from Sodus to Dansville, so I deviated to a southern heading toward the north end of Canandaigua Lake. Having lost track of them for a few moments, my eyes swept the sky for the two Champs and found them already sliding past my right wingtip as distant white dots. 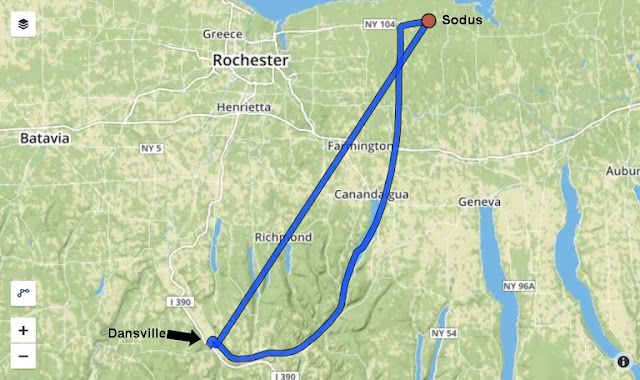 My detour followed a favorite sightseeing route that carried me over Canandaigua Lake from north to south, then along the natural contours of a valley that approached Dansville from the southeast. GPS ground track from ForeFlight showing my route from Sodus to Dansville. The scenic route worked well as a delaying vector. Although I was the first of the flight of four to arrive, the others joined the pattern right behind me. On the ramp, I was joined by Lee in 70Z (left of frame), Mike (right of frame) in a Champ, and Alan (background) in his Champ. The main hangar at Dansville received a facelift last summer when the original WWII era hangar doors deteriorated too much to salvage. A shame. The original facade had so much more character. August 27, 2017: Construction on the Dansville hangar in progress last summer. Breakfast was not quite so hearty and fresh as what I enjoyed with the guys the last time I joined them at Whitford's. There was some banter around sending a photo of the breakfast group in our fast food surroundings to John in Weedsport. "To guilt him over how far our standards have fallen?" I asked rhetorically. Lee, Mike, and Alan queued up to depart Dansville, Runway 32. If the breakfast itself was less than glorious, the company was excellent and it was a truly beautiful morning to fly. Departing Dansville, I climbed above a scattered layer to enjoy an aerial view from on top of the gauze. Near Canandaigua, I saw it; a partial glory cast upon the fragmented hints of clouds hovering below. In that moment, a routine flight on a nice day became something a little more magical.